Malaysia’s Good Food & Stay Guide » Blog Archive » Starbucks Free & buy 1 free 1! Starbucks Free & buy 1 free 1! Yet another fabulous opening of everyone’s favourite coffee, Starbucks, this time at the newly renovated Lot 10! 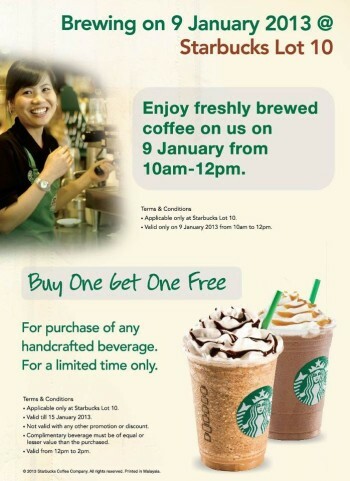 Today, 9 January 2013, Starbucks is giving out free coffee from 10am to 12pm! From 9 till 15 January 2013, Starbucks is having buy 1 free 1 handcrafted beverage between 12pm to 2pm! For those coffee addicts working around there, don’t forget to drop-by. This entry was posted on Wednesday, January 9th, 2013 at 12:21 am	and is filed under Cafes, Food Promo, Heavenly Klang Valley Food. You can follow any responses to this entry through the RSS 2.0 feed. You can leave a response, or trackback from your own site.